Milwaukee • The problem isn’t physical for Rudy Gobert. His right leg, the one Dion Waiters rolled up on and caused him to miss significant time, is fine. He hasn’t experienced pain since coming back three games ago from his bone contusion. Other than his customary ice pack after games, he hasn’t required additional treatment. Clearing hurdles mentally? That’s another story for Gobert and could be a reason his re-integration process with the Utah Jazz hasn’t been all that smooth. He’s been a beat slow challenging shots at the rim. He hasn’t yet had a monster rebounding performance. He’s not moving and defending in the last four games like the Jazz and Jazz fans are accustomed to. As Gobert works to get back to his All-NBA form, the Jazz machine has ground to a halt following his return. Following Utah’s 117-100 Saturday night loss to the Milwaukee Bucks, the Jazz are 1-3 in the week Gobert has been back in the lineup, after having won their previous five. In three of those games, he clearly hasn’t been himself, scoring in single digits against the Washington Wizards, Oklahoma City Thunder and Houston Rockets. He’s grabbed as many as 10 rebounds just once since he’s been back, against the Wizards. Still, on Saturday, he looked more comfortable against the Bucks. He scored a season-high 20 points on 6-of-8 shooting from the field. He got to the free-throw line 14 times and grabbed nine rebounds. Gobert and the Jazz know his return is a process. Utah developed a different style in his absence. So, Gobert’s presence not only means an adjustment for him, it’s an adjustment for his teammates as well. The starting lineup as a whole serves as the elephant in the room for the Jazz. Against Milwaukee, Utah started the game in a 16-5 hole, and surrendered nine of the first 13 second-half points. Together in their limited time together on the court because of Gobert’s injury, the trio of Gobert, Derrick Favors and Ricky Rubio are being outscored by 75 points on the season. Does this signify the starting lineup is a bad fit for each other? Maybe. But there may be little Jazz coach Quin Snyder can do to alleviate that issue. Gobert is an All-Star talent, so he can’t sit. 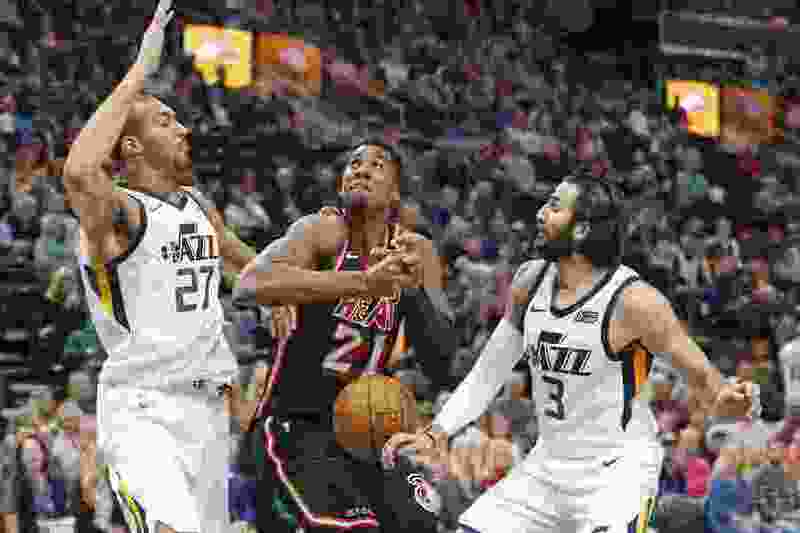 Favors is without a doubt one of Utah’s five best players, and sitting him would do two things: It would limit him to 15 minutes a night as Gobert’s backup, and it would torpedo his potential trade value. So sitting him isn’t an option. The Jazz traded a valuable first-round pick for Rubio, and Dante Exum won’t be healthy for at least a few months. So it makes no sense to give up on him. The Jazz are just going to have to make their lineup work. On Saturday, Snyder made an effort to keep Rubio and Favors on the floor together, because Rubio works better with Favors on the pick and roll. One of the reasons Gobert found more opportunity is because he was on the floor more with Mitchell and Joe Ingles, both of whom found him for easy baskets. Utah’s due to get a bit healthier in the near future, Raul Neto’s concussion not withstanding. Shooting guard and leading scorer Rodney Hood could return from ankle soreness as soon as Wednesday night’s matchup against the Chicago Bulls, sources tell The Tribune. The Jazz hope to get Joe Johnson back at some point during the current road trip. Still, Gobert is the centerpiece, and the starting lineup is the biggest concern. For the Jazz, getting their franchise talent back to peak level is a priority. Finding continuity among the starters is another.